I recommend using a Champagne Saucer glass for this cocktail. For these two cocktails, load up the ingredients into a cocktail shaker with ice. Make sure you shake it really well to mix everything together. You could also do a dry shake (without the ice) for a minute to emulsify the egg white and then add the ice and shake for another 20 seconds. Garnish with a cherry. In my case, I tried to fancy it up with 2 lime peels and a cherry. 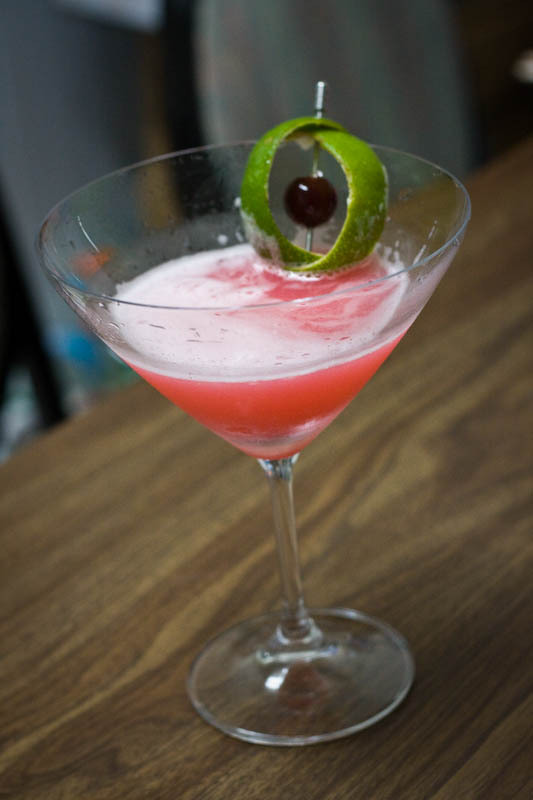 The original cocktail, the Pink Lady, has many variations for ingredients. The basic recipe calls for Gin, Grenadine, and Egg white. When I learned to make this drink, sweet cream was also part of the recipe for the Pink Lady. However, I later discovered that the creamy version is known as a Pink Shimmy. A bit pricey but for a quality drink, you’ll want this. I’m pretty sure this is what most quality bars making this drink will use.